In honor of Women’s History Month, we’re publishing recent important statistics about women in America from the U.S. Census Bureau. While women continue to make strides in income, skilled occupations and education in this country, there is still room for gains in equality. 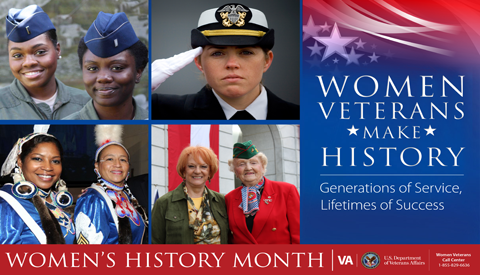 To all the women out there – especially those women who have served in the military – we salute you! Power in Numbers: In 2013, approximately 4 million women inhabited the United States alongside approximately 2 million men. That means women outnumber men by a ration of 2:1! The Capitol of Women: The state with the highest percentage of women is the District of Columbia, where 52.6% of inhabitants are female. The Best Medicine: One of the skilled occupations that has seen the greatest growth in women workers is pharmacy work. The number of women who are trained and work as pharmacists has quadrupled since 1970. While only 12.1% of pharmacists used to be women, starting in 2006, over half of all pharmacists were women. Earning Inequality: The median annual income of women working full-time as of 2013 was $39,157, while men earned an average of $50,033 a year. Food For Thought: In fall 2013, 56.2% of all college students (undergraduate and graduate) were women. That’s approximately 10.9 million women who are on their way to earning degrees and entering the workforce.